Learn why and how to prune herbs in this detailed guide. Pruning herbs make these plants productive, healthy, and flavorful! Your herb garden needs your attention for optimum growth. Of all other aspects of caring for herbs, pruning is also a significant one. Overlooking it can give you a not-so-productive herb garden. The herb garden will show abundant growth if you prune it routinely. Pruning also encourages bushier and fresh growth and to avoid flowering and seeding. To keep the plants compact and in shape. It’ll also promote good air circulation and save up space for other herbs. For availability of fresh herbs in the growing season or storing them for future use. The trimmings can be used for propagating new plants. While it’s true that pruning herbs is beneficial but excess pruning can be detrimental. Cut back the plant too much, and it’ll not grow back the same again. It’s best to avoid cutting more than one-third of the plant at one time. You can give the plant a light pruning or hard pruning–it entirely depends on the type of herb you’re growing. Let’s discuss two kinds of herbs and pruning in details. Herbs such as basil, stevia, oregano, cilantro, chives, lemon balm, mint, etc. are herbaceous plants and do not have woody stems. Many of these plants do not survive harsh winters (unless you live in a mild climate) and grow with vigor only in springs and summers–they are technically annuals. These plants are most suitable for light pruning. Don’t prune these herbs heavily, trim mainly from the top, skipping the sides. The herbs will grow bushier and productive with each light pruning cycle. Simply pinch back the top part along with the first set of leaves, just above the leaf node. 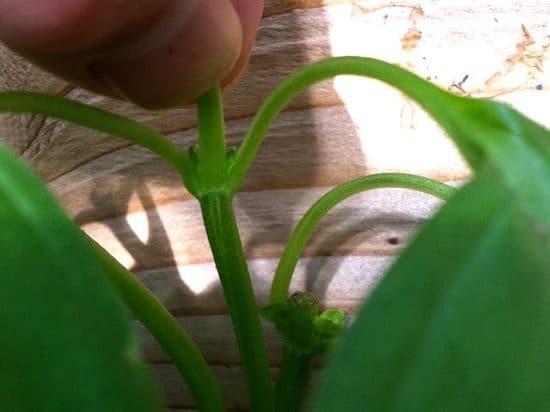 This pinching will remove the terminal bud and allow the non-growing lateral buds to grow and the plant will become fuller, forming more stems and side shoots. You can trim more growth but with the point in mind–always cut above the leaf node or lateral buds (emerging little stems). This type of pruning can be done anytime or when you’re harvesting these herbs, instead of only picking the leaves, apply this method. Don’t over-prune these herbs and leave them balanced. Usually, regularly harvesting them is enough. Also, snip off the blooms as soon as they appear. It’ll keep the energy directed toward more foliage growth. 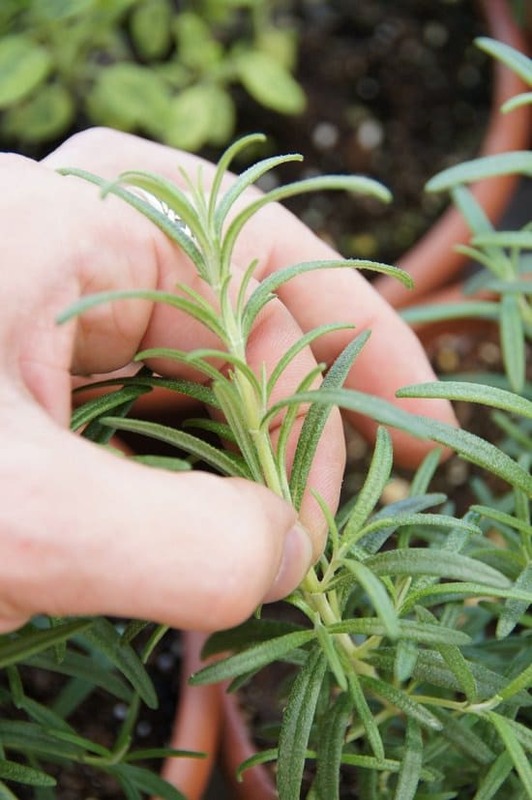 Rosemary, lavender, thyme, bay, and sage are some of the herbs that show robust growth without much care and require hard pruning. In other words, the evergreen or perennial herbs in your climate require hard pruning. The best time for pruning such herbs is at the beginning of the growing season when the herbs start to grow. Wait until you see some new growth, young leaves, and buds forming. Perennial herbs can go on without pruning. But, to maintain their shape and size and to get new and more flavorful foliage, it’s required. Cut back all the dead, decaying, and crossing woody stems. This much pruning is fine for a healthy plant. However, if your herb is leggy or overgrown, cut back about one-third of the plant. Do not prune these herbs when they become dormant or when they are at the end of the growing season. Cutting this time will spurt new growth, while the plant is getting ready to go dormant. Pruning once in a year is sufficient for these herbs. You can also perform slight pruning once after they flower. No matter the type of herb, pinching a young plant prevents leggy growth and make it bushier and improve its structure from the beginning. For this, pinch out the stem tips along with the first set of leaves. Pinch off the growing tips when the plant is 4-5 inches tall and has grown a few sets of true leaves. This tutorial video here will help you. The more explanatory version–Find a pair of buds, you’ll usually find them just above the point where the leaf joins the stem. 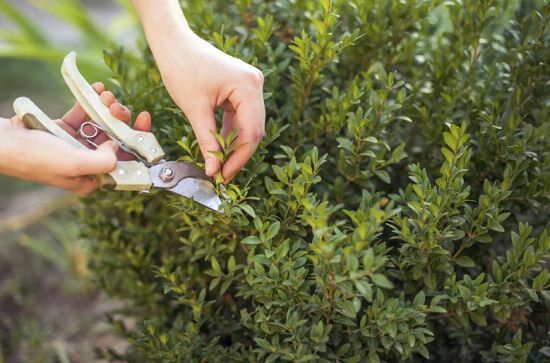 Now easy, remove the growth above the buds and leaves using sharp shears or fingernails. This process will activate those buds, and your plant will start to become bushier.